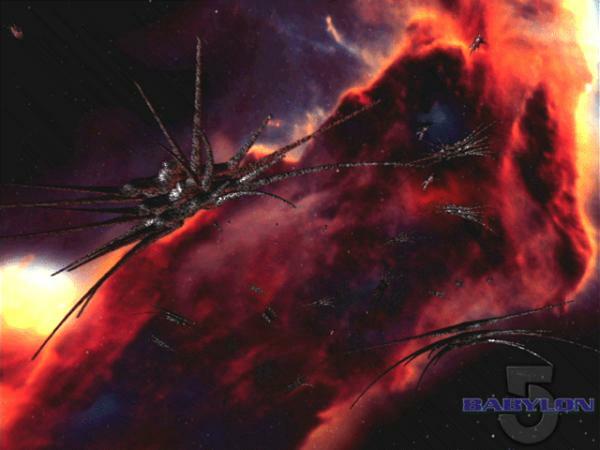 Description: The Shadow Cruisers are incredibly powerful ships, only rivaled in power by Vorlon ships. They resemble huge black spiders, with 10 spines sticking out on each side, and they are organic in nature. Shadow Cruisers are extremely maneuverable for ships of their size, they appear to be at least 1 km wide between the farthest "spine"-tips. The weapon of choice is an extremely powerful beam weapon that easily slices through most ships and space stations. They can also launch jump-point de-stabilizers, destroying ships that attempt to escape. The Cruisers also carry many Shadow fighters that can be launched together. 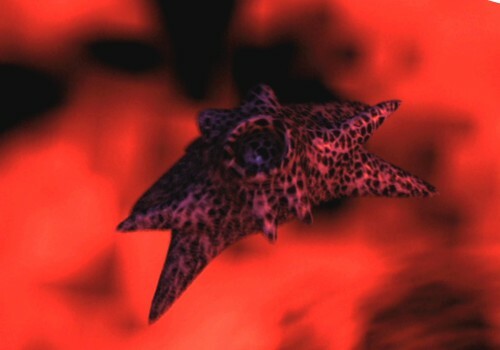 The Shadow Cruisers enter and exit hyperspace by "phasing" in and out of normal space, a more advanced and faster method than using jump-points. This "phasing" is often mistaken for "cloaking", which it is not. Description: The Shadow Fighter is, like the Cruiser, based on advanced organic technology. It is very maneuverable, and its overall length appears to be 30-40 meters. It appears to have only one weapon, a "ball" of energy that it shoots out of the frontal opening. As the Fighter fires, it expands and contracts, earning its nickname "Spitfire"